In another attempt to stem the economic threat of high student debt and win favor for his party before November’s election, President Obama on Monday signed an executive order that will limit federal student loan payments for 5 million more people. Calling an education “the single best investment you can make in your future,” Obama extended the four-year-old Pay As You Earn initiative, which has lowered monthly payments for student who borrowed federal student loans for the first time between 2008 and 2011. The program lowered monthly payments to 10% of a borrower’s after-tax income. Borrowers who graduated before 2008 or after 2012 had access to another program, which limits student payments to 15% of income. Monday’s executive order will extend the initiative to anyone with a federal student loan. It also adds another dimension: forgiveneness of student loans. If borrowers make regular payments on the PAYE program, the government will forgive any unpaid portion of their loans after 20 years. Forgiveness comes even sooner for students who decide to take government or nonprofit jobs, who will find themselves released from their loans after 10 years of regular payments. There is also an element of political timing to the announcement. In September, Democrats face bitter battles for control of the Senate and the House. Still, student loans remain a sweeping and intractable problem,which Obama acknowledged. The last major piece of legislation on them passed in 2010. 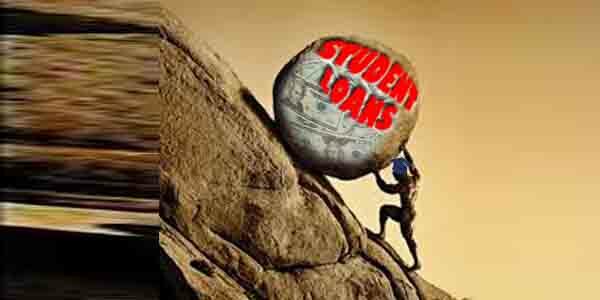 One barrier to PAYE, as the program is called, is that few people with student loans have shown any interest in it. Only about 200,000 people have reportedly opted for the current version of the program, according to Vox, although 17.5m people qualify. Another barrier to the effectiveness of PAYE: borrowers will have to be patient. The order won’t go into effect until December 2015, meaning borrowers will still have make thousands of dollars in student-loan payments for the next year and a half. The program also doesn’t address the rocketing price of tuition, which has grown by more than 250% over the past 30 years at public four-year colleges. Also out in the cold are those who didn’t qualify for federal student loans and hold private student loans from banks. There is about $1.1tn in outstanding student loans in the US, and the individual burden is an average of $29,000 per borrower. Student loan payments recently hit a record high compared to disposable income for many families. Student debt made up 63% of the $180bn gain in total household debt between the end of 2012 and the end of 2013, according to economist Kristin Reynolds of IHS Global Insight. Obama compared the burden of current students with his when he was younger, when he paid off his undergraduate education at Columbia in a year. “In the 1970s, the 1980s, when you went to college, you didn’t anticipate you’d have this massive debt,” Obama said. The problem is a sweeping one. Student loan debt is “one of the greater risks to the consumer economy” over the next five to 10 years, Janney Capital Markets managing director Guy Lebas wrote this year. Bloomberg economist Richard Yamarone called student loans “the next subprime crisis” and warned that the high default rate on student loans threatens the economy. “Loans to students are essentially the only extension of credit one can get today without a job income, or asset,” Yamarone wrote.